At the end of 2012 Instagram, the online image-sharing company recently acquired by Facebook, announced new changes to their Privacy and Terms of Service policies that caused tremendous backlash from the public and from their users. 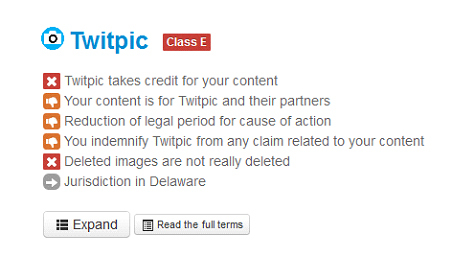 You agree that a business or other entity may pay us to display your username, likeness, photos . . . and/or actions you take, in connection with paid or sponsored content or promotions, without any compensation to you. Instagram needs a license from the user in order to use your information or content for advertising purposes. Changes in the policy reflected this by deleting the language suggesting that the user grants Instagram a “limited license” over their content and instead stipulating that the license is “royalty free, transferrable, sub-licensable,” and “worldwide.” Some have commented that this change effectively grants Instagram unlimited commercial rights over its users’ content, making it the world’s largest stock photo company. Practically speaking, this means that let’s say a restaurant was advertising on Facebook. They could include a user’s Instagram photos from dining in their restaurant in their ads without any restrictions or compensation to you the user. Making matters worse, the only way for users to opt out of the new licensing arrangement is to delete their Instagram account prior to January 16th, the day the changes take effect. The new language means that if a user posts pictures after January 16th but subsequently deletes their account, they may have granted Instagram an irrevocable right to sell those images in perpetuity. The backlash to these proposed changes over the past few days has been tremendous. Users have vociferously opposed the changes, while competitors have jumped at the chance to lure away these unhappy users. In light of the negative attention these changes are getting, Instagram backtracked on the proposed changes. The company apologized to it’s users just days after the proposed changes were released and promised to remove the controversial language from its terms. The Instagram terms fiasco also highlights the tension between online services, the personal data they control, and the unilateral nature of the terms of service. Added to this is that these online services are free, and they provide these services for free on the hopes of monetizing their user base through advertisements. Should we really expect all control of our digital assets and for free? If you really want to control your digital assets then perhaps hosting them on your own website is the best way to go. Otherwise, if you are looking for free services, you usually get what you pay for.